CVGHM reported that the number of deep and shallow volcanic earthquakes at Guntur increased during 15-21 August; seismicity declined after that period. On 30 August at 0820 seismicity again increased, characterized by continuous tremor that lasted until 1450. At 1600 CVGHM raised the Alert Level to 2 (on a scale of 1-4) and reminded residents and visitors not to approach the active crater within a 2-km radius. During December 2002, the Volcanological Survey of Indonesia (VSI) reported that activity at Guntur was higher than normal. As a result, the Alert Level was raised to 2 (on a scale of 1-4). No plume was observed, but deep and shallow volcanic earthquakes were registered, as well as tectonic earthquakes, through at least mid-May 2003. Tremor was also reported occasionally (table 1). On 28 December a "white ash plume around Guntur crater and Kabuyutan crater reached 3 m high." No ashfall was reported. The temperature at Guntur crater was 79.7°C and at Kabuyutan was 92.7°C. EDM deformation measurements taken on 22 November, 14 December, and 28 December 2002 revealed 11 cm of inflation. On 13 January 2003, an earthquake (MM 2-3) was felt in surrounding areas. Elevated tremor was noted during the first week of April 2003. Guntur remained at Alert Level 2 throughout mid-May. Table 1. Seismicity at Guntur during 1 December 2002-18 May 2003. Courtesy of VSI. CVGHM reported that in early March a slight increase of deep and shallow volcanic-tectonic earthquakes at Guntur was recorded; volcanic tremor became continuous on 2 April, prompting CVGHM to raise the Alert Level to 2 (on a scale of 1-4). Temperature measurements of hot springs in five different areas fluctuated until mid-April and then were relatively stable through early May. Seismicity also decreased in early May. On 7 May the Alert Level was lowered to 1. During 9-15 December higher-than-normal seismicity at Guntur led VSI to raise the Alert Level to 2 (on a scale of 1-4). Visual observations of the summit did not reveal any surface changes or ash plumes. In comparison to the previous week, the number of shallow volcanic and tectonic earthquakes increased, while deep volcanic earthquakes decreased. Seismicity remained higher than normal during 16-22 December, but fewer earthquakes occurred than during the previous week. The Alert Level remained at 2. 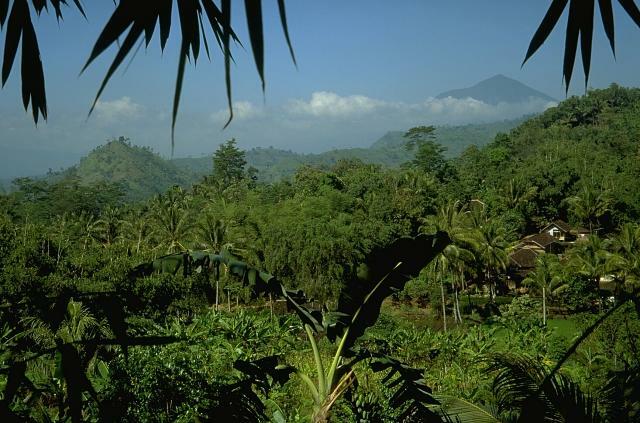 Guntur is a complex of several overlapping stratovolcanoes about 10 km NW of the city of Garut in western Java. Young lava flows, the most recent of which was erupted in 1840, are visible on the flanks of the erosionally unmodified Gunung Guntur, which rises about 1550 m above the plain of Garut. It is one of a group of younger cones constructed to the SW of an older eroded group of volcanoes at the NE end of the complex. Guntur, whose name means "thunder," is the only historically active center, with eruptions having been recorded since the late-17th century. Although it has produced frequent explosive eruptions in the 19th century, making it one of the most active volcanoes of western Java, it has not erupted since. Wikartadipura S, Sumpena A D, Djuhara A, Santoso M S, Phillips, 1993. Volcanic hazard map of Guntur volcano, West Java. Volc Surv Indonesia, 1:50,000 map. There is no Deformation History data available for Guntur. There is no Emissions History data available for Guntur. Guntur is a complex stratovolcano composed of older volcanic complexes on the NW, and a younger group of cones on the SE. The youngest cone, Guntur (whose name means "thunder"), seen here in the upper left center of the photo from the Volcanological Survey of Indonesia observatory on the south side of the volcano, has been the source of frequent explosive eruptions in the 19th century, but has not erupted since. The peak at the right is Gunung Picung. The forested hills in the foreground are part of a massive, hummocky debris-avalanche deposit that originated from a prehistoric collapse of Guntur volcano, seen in the distance at the upper right. 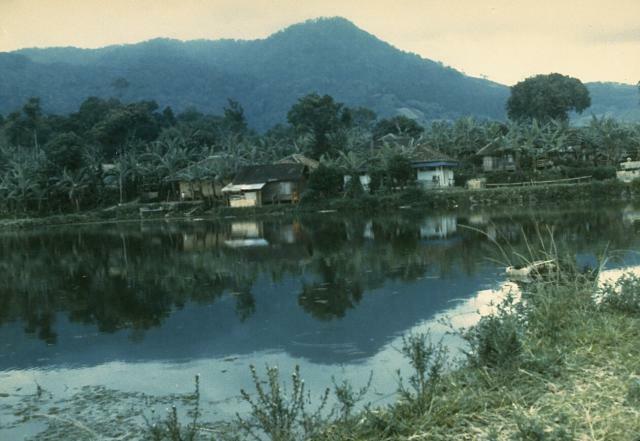 The older, NW portion of Guntur volcano rises above a small lake at the hot spring resort of Cipanas SE of the volcano. 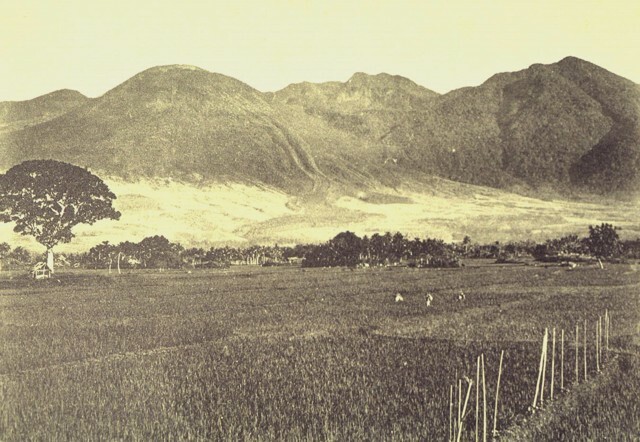 Gunung Guntur and neighboring volcanoes surrounding the plain of Garut were some of the oldest tourist destinations in Java. Among the attractions of the Cipanas hot spring resort is Komparan ("The Oven"), a steaming mud pool that is used for cooking. 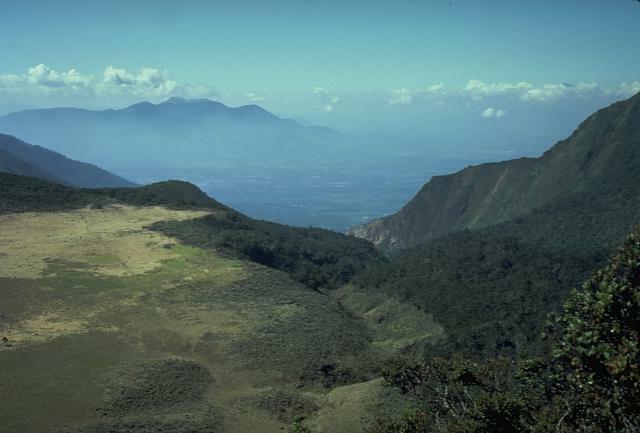 Photo by J. Matehelumual, 1986 (Volcanological Survey of Indonesia). Gunung Guntur at the right center, the youngest cone of the Guntur volcanic complex, consists of a younger SW part with cones lying along a NW-SE trend, and an older, more eroded complex to the NW. 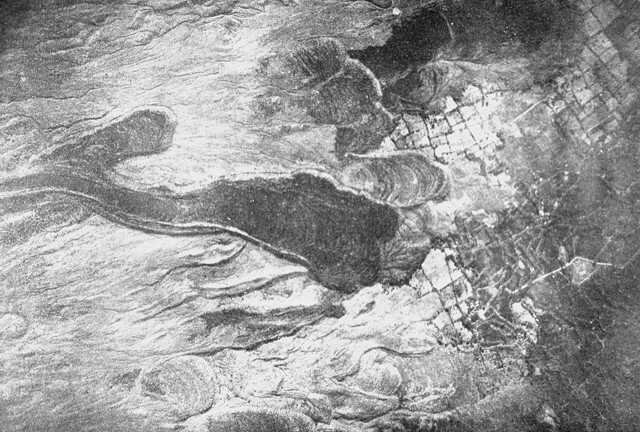 Youthful lava flows can be seen on the lower right-hand flanks of Guntur, whose name means "thunder," a reflection of frequent eruptions in the 19th century. 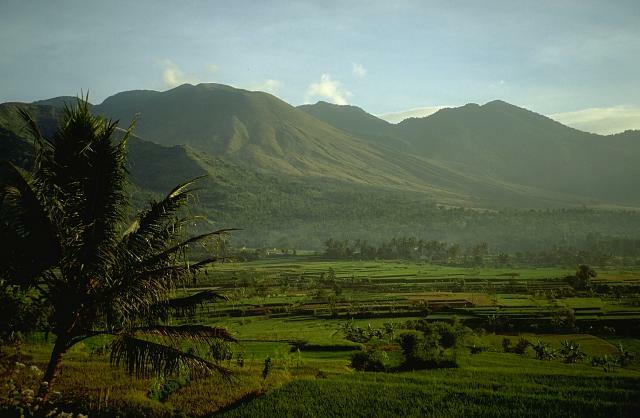 The complex volcanic massif is one of many volcanoes ringing the plain of Garut, one of the oldest tourist destinations in Indonesia, once known as the "Switzerland of Java." Photo by Ruska Hadian, 1988 (Volcanological Survey of Indonesia). 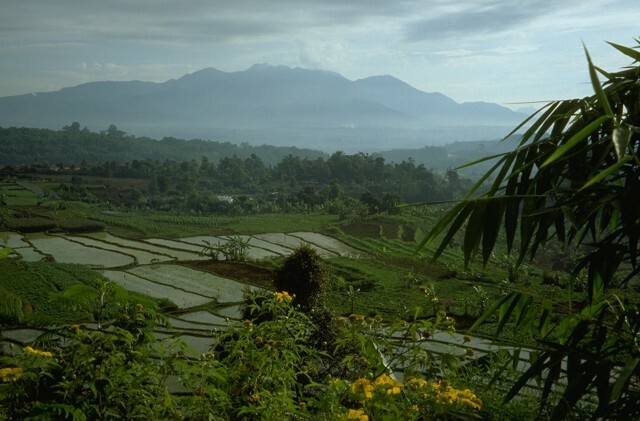 Guntur volcano, is viewed here from the south near the foot of Papandayan volcano, looking across rice fields in the plain of Garut. Guntur is one of a group of volcanoes surrounding the city of Garut, a popular tourist destination in an area once known as "The Switzerland of Java." The rounded profile of Gunung Guntur, the youngest cone of the Guntur volcanic complex, appears on the right horizon. The prominent levees of a historical lava flow (center) can be seen descending the SE flank of Guntur volcano. The rounded summit at the left is Gunung Guntur, the youngest peak of the volcanic complex. To the right are Gunung Batususun and Gunung Picung, part of the older massif. Fresh-looking lava flows, some of historical age, descend the SE flank of Guntur volcano, encroaching on rectangular areas of cultivated fields. Note the prominent flow levees from the youngest lava flow, partially overriding levees of older flows. The summit of Guntur volcano is seen here in an aerial view from the SW with the crater of Gunung Masigit in the foreground. The forested 250-350 m wide crater is about 100 m deep. 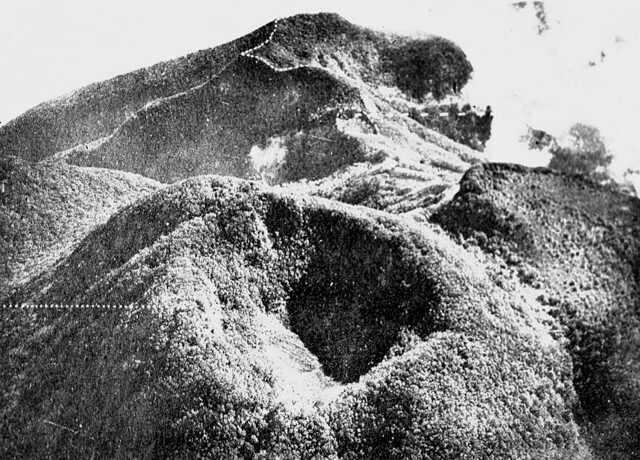 A smaller crater (outlined by a dashed line) lies at top center below the crater rim of Gunung Agung (top). The historically active crater of Guntur lies off the photo to the right. Large Eruptions of Guntur Information about large Quaternary eruptions (VEI >= 4) is cataloged in the Large Magnitude Explosive Volcanic Eruptions (LaMEVE) database of the Volcano Global Risk Identification and Analysis Project (VOGRIPA).